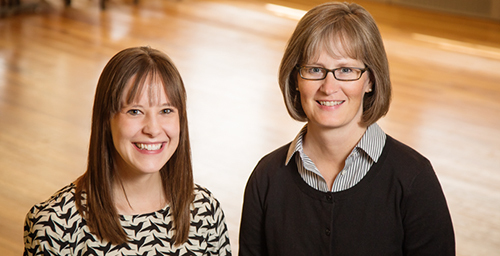 Social support may be critical to some women's weight-loss and maintenance efforts, according to a new study by (from left) graduate researcher Catherine J. Metzgar and professor Sharon M. Nickols-Richardson, both in the department of food science and human nutrition. CHAMPAIGN, Ill. - Being accountable to another person and receiving social support may be vital in motivating some women to lose weight and keep it off, a new study says. Although a number of researchers have cited the importance of personal accountability - such as weighing oneself regularly - to control one's weight, some women in a recent weight-loss study led by researchers at the University of Illinois said being accountable to others was the critical factor in their success. Researcher Catherine J. Metzgar conducted focus groups with 23 women about a year and a half after they completed a weight-loss program to determine which factors helped or hindered dieters' success. The 18-week weight-loss program reduced participants' food consumption by 500 calories a day, included two snacks and emphasized strategies such as portion control, eating more vegetables and planning ahead. "Our women didn't find that accountability to themselves was so important, but having support from others was - just having that social support from someone who was going through the same experience," said Metzgar, a graduate research assistant in food science and human nutrition. "What this study shows is that if you can find that one friend who has the same goals or can just hold you accountable, it is really helpful." Many of the women found that the program's weekly educational group meetings had provided the accountability, support and motivation they needed while dieting. But when the program ended, and no one was monitoring their progress any longer, some dieters' motivation fizzled, and they fell back into old habits. Renewing their self-motivation day after day and staying focused on their goals without others' support were significant struggles for these women. Likewise, a major obstacle for some of these dieters was a lack of social support from significant people in their lives. Rather than encouraging the dieter's efforts to get healthier, some friends and family members responded negatively, intentionally or unintentionally sabotaging her progress by making unhelpful comments or tempting her with high-calorie foods. Life transitions - such as graduating college and starting a sedentary job, getting married, pregnancy and childbirth - were pitfalls for many of the women, triggering "continual bouts of weight gain, weight loss, maintenance and prevention of weight regain," the researchers found. "They were very aware of life transitions having a meaningful impact on how they were able to lose weight or maintain that weight loss," said co-author Sharon M. Nickols-Richardson, a professor of food science and human nutrition and Metzgar's faculty adviser. "The women very clearly articulate their awareness of life transitions and their impact on food behaviors. Several women referred to it as a 'weight-loss journey,' indicating that they realized that they needed a total lifestyle change, rather than a temporary diet to achieve and maintain weight loss." Women who succeeded at maintenance engaged in regular exercise and said they "listened to an inner voice" that reminded them to control their portion sizes. These dieters also adopted a "fresh-slate mentality," forgiving themselves for "slip-ups" and "bad days," and got back on track with their eating and exercise programs right away, rather than letting one lapse in judgment or willpower trigger a downward spiral, Metzgar said.